In our modern society, people aren't given enough time to grieve their losses. The pressures of work, even the simple emotional need to 'be busy,' often bring the bereaved back into the 'real' world far too soon. Having a permanent place to remember - in a cemetery, mausoleum, or cremation garden - that can be visited regularly by family and friends is helpful to families during the time following a death. Dogwood Memorials strives to help families create a meaningful memorial for their loved one. Dogwood Memorials has a certified design center, which has the latest in memorial design technology. Our associates have undergone training to ensure families receive a custom, crafted memorial as unique as the loved one being honored. The latest in design software allows families the opportunity to see the design as a color picture in real time, so additions and adjustments can be made immediately. It is our hope you will give Dogwood Memorials the opportunity to help you celebrate and honor your loved one. It is so important to create a permanent memorial for family and friends to visit now, and to be a memorial for future generations. 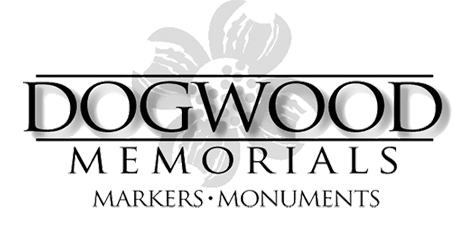 Please call Dogwood Memorials at 706-955-0335, because "they deserve to be remembered".